inspectiTRAC customers range from a single-plant Turkey processing facility completing over 20 inspections per day to a manufacturing company completing safety audits, inspections and behavior observations to a major cheese company completing job skills audits to a top 10 food industry company completing GMP audits, safety hazard analysis, and behavior observations. Below are Case Studies created from a few of our current customers that outlines the situation that had existed in their company and how inspectiTRAC was used to improve their process, save them time, and reduce their costs for inspections, audits and observations. This client uses the inspectiTRAC system in many facilities. This case study focuses on the use of inspectiTRAC at one specific facility to replace monthly paper-based safety-related inspections. In addition to having inspection data readily available to management, use of inspectiTRAC resulted in a phenomenal 70% to 80% reduction in labor cost. Download the Mobile Inspection System Case Study here. This client uses the inspectiTRAC system in many facilities. This case study focuses on the use of inspectiTRAC at one specific facility to replace paper-based quality audits. Initially, the system saved 30 non-value added hours per month. As the client expands use of the system, they estimate further time savings of 90 to 150 hours per month. Download the Mobile Quality Audit System Case Study here. This client uses the inspectiTRAC system to perform safety observations of employees in all areas of the plant. 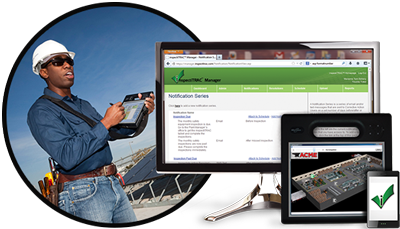 Each of their 155 plant employees takes a tablet loaded with inspectiTRAC to the plant floor and answers safety observation questions. Plant management is able to see who completed their observations and, more importantly, where and how often safety risks occur. Download the Mobile Observation System Case Study here.